Tecno is known in Kenya and beyond for its mobile phones. Its feature phones and smartphones have been around for quite some time now and have caused upsets for the status quo in markets like Kenya. Now, the company is trying its hand at something new: wearables. Over the course of the last few weeks, I have had Tecno’s new smart bracelet, the T-Band, strapped on my wrist during my daily commute, as I went on with my day-to-day hustles, as I slept. Basically, it’s been on me all along. Eem, save for a week when our own Sally took it for a spin as she reviewed the Camon C9. As a result, I have made quite a number of observations. The T-Band like any other smart bracelet or fitness tracker you will come across takes on a minimalist design. Since it lacks a display, there are two LED indicators that when specified in the T-Band’s accompanying app, will blink repeatedly when there is a new text message or incoming call. The LED indicators are what separate the central or main part of the T-Band from the plastic straps. The T-Band itself is all made of plastic with the exception of the metallic clasp. The most visible and central physical feature of the T-Band is the round button or the camera button as Tecno calls it. It serves several functions: restarting the wearable, reconfiguring it so that it pairs with a new device and capturing photos remotely. The T-Band’s back only has two visible pins for charging it using the provided dock. The minimalist design works in the device’s favour as it stays on your wrist without attracting any unwarranted attention but still doing what it’s supposed to do. On the other hand, its light weight and the fact that the clasp does not stick as tight as I wanted it to means that it is easy for the T-Band to fall off from your wrist without you noticing. The T-Band’s advertised functions are pretty straightforward: sleep tracking, pedometer, alarms, phone finder, remote camera capture and call and message notifications. The first step to get it working is to pair it with a compatible device. This can be any smartphone running Android 4.3 Jelly Bean going up. For best results, a Tecno device running Android Marshmallow is recommended. By best results, I mean being able to check all the functions I have listed above. I was able to use the T-Band to capture photos with the Tecno Camon C9 but I was not able to do the same on other devices like the Huawei P9 or the Samsung Galaxy S7 despite the two devices being able to pair up well with the T-Band. This is because remote capture is only possible on Tecno devices for reasons beyond my understanding at this time. The second step is to install the T-Band application on your smartphone. This is easy as you only need to head to the Google Play Store then sign in with your Tecno account (or create one if you don’t have it). Pairing with the T-Band is via Bluetooth so you have to turn it on then search for the T-Band. Once paired, fire up the installed T-Band app and connect the device then you are good to go. The third step is to set up your profile in the ‘Personal centre’ section of the app which can be reached by tapping the profile picture under the ‘My’ tab. This allows one to add an avatar and important personal information which the app needs if it is to function as intended. For instance, your weight, height, age, locality, gender, favourite sporting activity and so on. As you will find out soon, however, the T-Band app is far from being something you look forward to using every other time. I spent an entire day trying to figure out why, despite having walked all day, the app was not displaying those stats. I even sought the help of Twitter to figure that out. Only for me to discover later that despite the app emphasizing on having an internet connection every time I launched it, it did not refresh automatically when connected via Bluetooth to the phone. One needs to pull down to refresh. So simple yet so hard to figure out if you don’t know. Only the leaderboard (identified as ‘Ranking’ on the app) refreshes automatically when the app is launched and there is a data connection. That is not all. The app aside, the T-Band does seem to have an issue. While the pedometer functions well, the sleep tracker is mostly useless. It registered hours when I was sitting at my desk working or somewhere in my neighbourhood club watching the Euros as my sleeping hours. For real! At no given time was it able to correctly note when I was sleeping. I was in a matatu heading home and walked for a few more minutes later on. According to the T-band, I was fast asleep. It makes sense that once paired with a Tecno device like the Camon C9, the T-Band can be used to remotely capture shots but otherwise, it’s a feature I did not miss once I paired it with other devices. Still, it’s an interesting implementation. Long-pressing the camera button on the T-Band results in the camera app on the Camon C9 opening up. Once the viewfinder is on, pressing the button results in an image being captured. Suave! The alarms and phone finder are, in addition to the call and message alerts, some of the best features of the T-Band. If you’re one of those people who will go to the living room and forget where you kept your device, invoking the help of the T-Band will result in a disturbing alarm emerging from somewhere inside the heavy cushions of your sofa. The same can be applied anywhere else just as long as the T-Band is paired with the device. For the alarms, the T-Band will vibrate when morning sets in and you’re still in bed. If you need it to, by activating ‘Smart Alarm’, it will offer to begin the wake-up process even half an hour before the set alarm goes off. The leaderboard is a nice touch as being able to see how other guys in your city are faring can invoke the competitive spirit in you and lead to you being motivated to make a few hundred more steps just to stay ahead of the curve. The one last awesome feature of the Tecno T-Band is, unsurprisingly, the battery. The T-Band has a guaranteed 2-week battery life when always connected to a companion device via Bluetooth. In my tests, it was only after 16 days that I finally got this notification reminding me that the T-Band needed to be juiced up. Half-way through the 17th day, it finally fell and I had to charge. That is awesome. I don’t need to have to remember to carry one other charger. Talking about the charger, the T-Band’s dock is well thought out. Unlike other wearables I have used in the past this is one of the few that makes using them effortless. Just plug it in to a power source like your computer or wall adaptor and place the T-Band on top. Done! One more thing, the T-Band can be set as an Android Trusted Device since it connects via Bluetooth. What this means is that the paired smartphone remains unlocked as long as the T-Band is connected or within range. It’s stylish and naturally finds its place on your wrist without screaming. Well-designed charging dock makes it easy to charge the device. You only need to use other wearables to understand why this is important. Long battery life. The last thing one needs is to remember to charge something like the T-Band daily. It works with any Android smartphone running Android 4.3 and up (according to the latest data from Google, that’s 80% of all Android devices in the world so pretty much any device that matters can pair up with the T-Band). The software is simply not up to scratch. The app needs some serious work. Since the T-band lacks a display, the app is the only interface accessible to the user. It is the only way to interact with the device and as such, should be made better. You can only use the remote camera function on a Tecno smartphone running Android Marshmallow. While the remote camera function is a feature you won’t miss if you don’t have, it can be a big attraction to all users. 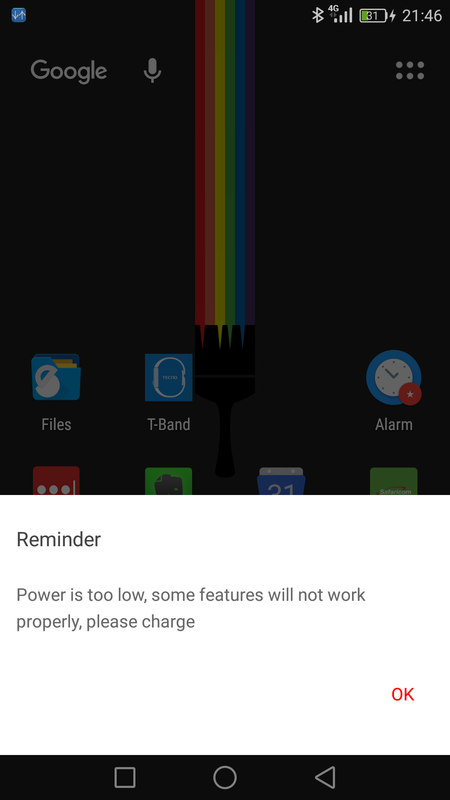 One needs to make sure the T-Band app is always running in the background if a connection between it and the paired smartphone is to be maintained. I found that to be counterproductive. Other than the period I was closely monitoring the T-Band for the sake of this review, I opted to just pair it to my smartphone periodically so that I could sync the data and not all the time since that always meant having to make sure the T-Band app is not killed by the system. The T-Band’s accuracy is still a big factor. I’ve used a wearable that can track my sleep before and I exactly knew what to expect. The T-Band didn’t and it ended up recording the 100 or so minutes I spent watching a single Euro 2016 fixture as sleep. A friend recently told me that the only reason they wouldn’t get the T-Band is because it lacked a display. At no point in my usage of the T-Band did I desire a display. As long as I get a fully functioning application then I am just fine. However, the friend did raise a valid point and it is something that Tecno may want to explore for the next generation of the T-Band. It’s the usual natural evolution of cheap wearables we’ve previously seen like Xiaomi’s Mi Band. I like the T-Band as it is and would like it more if I did not get a degraded experience on the app because for Kshs 3,000 I expect more. Or maybe I expect too much from something that is just supposed to be a “fashionable smart photo band” that Tecno gave away for free to customers who pre-ordered the Camon C9.